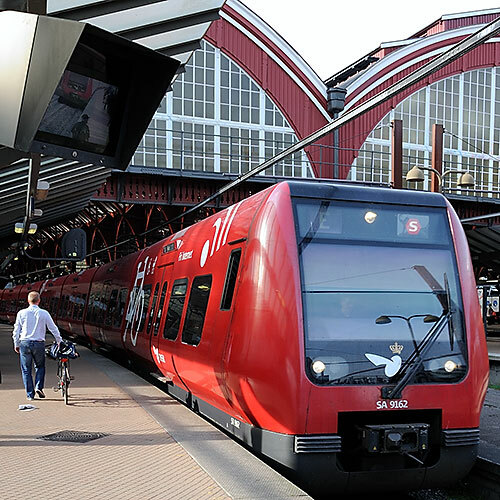 In Zurich, Copenhagen, Berlin, Vienna, Munich, Stockholm and Amsterdam I traveled on transit networks that struck me as far superior to anything available in the states. Even New York City compares badly. Further, these cities are linked to other European metropolises by gleaming, clean, comfy, frequent running trains. I believe many Americans would be shocked by the light-footed carfree mobility available in these cities. (Although their transit networks coexist with auto traffic.) Hop on a train downtown; hop on a tram or bus for shopping; hop on another train for a weekend in Paris, Rome, Vienna; go wherever you wish, no car needed. The USA doesn’t just fail to match up; it looks backward, pathetic. In Tokyo, Seoul, Hong Kong and Shanghai, I rode huge, modern, clean, jam-packed metros that advertise poorly for the carfree life, and would make many tourists thankful for cars in sprawling suburbs. 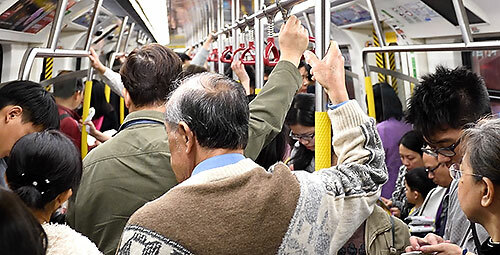 I couldn’t and can’t picture Asian VIPs getting around in these swamped-with-humanity subways. The brawny rail transit networks are for separate-and-unequal masses, and underscored the hated car’s potential role as an equalizer, a liberator. 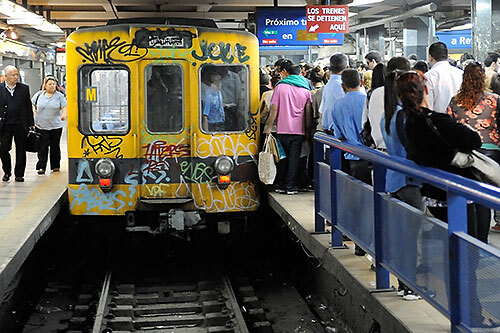 In Rome and Buenos Aires, I rode wretched, graffiti’d metros that I interpreted as failures of government, that reminded me of municipal dysfunction sometimes seen in the U.S. I suspect that most cities are kludges, as the human brain is an evolutionary kludge, and grew in messy, helter-skelter ways. Visiting dozens of ’em helped hammer that point home. New York City got a subway to transport dense-dwelling masses when cars were finicky, pricey and rare. Greater Los Angeles, in turn, mostly happened in the age of the automobile, and had plenty of real estate to spread upon. I may adore planned, transit-oriented developments like those surrounding Stockholm and Copenhagen, but can’t cite all that many of them. Human agglomerations may be unpredictable, tough to accommodate in long-range plans. What if Henry Ford hadn’t grown up in Michigan? What gets built generally stays put, for better or worse, becomes part of city infrastructure until the next catastrophe or war. Los Angeles and Houston freeways are the homely fruit of billions of investment dollars. These cities are as likely to reinvent themselves as transit Shangri-las as Mount Everest is to reinvent itself as a cow pasture. I’m more convinced than ever that big, thriving cities as a whole — and please heed that qualifier, gentle reader — can fare better by emphasizing alternatives to the car. They can be greener, better looking, safer, friendlier, less congested, more walkable, superior in almost every respect. The personal automobile deserves its rep as one of history’s most destructive consumer products. Alas, if the city can’t or won’t make car alternatives work, the individual member of that vast municipal organism may be better off if she owns one. Cars are speedier, more comfortable, tote cargo, don’t go on strike, insulate riders from vomiting drunks and other unappealing fellow citizens. Most importantly, the personal car encourages the kind of spread-out, quarter-acre-of-your-own, every-man-a-king living that urban planners decry as sprawl, but that can look mighty appealing to someone trapped in a transit-friendly cubbyhole next door to a Death Metal buff. I can’t prove it, but would make book that virtually all American politicians and VIPs choose the personal car for their own travel. (Some credible exceptions: Michael Bloomberg of New York, VP Joe Biden, Berkeley mayor Tom Bates.) I can’t see Miley or the Biebs closing the concert early to catch the last Wilshire 720; can you? I think Jane Q. Public should assume that the U.S.A.’s rich and celebrated are going to get around in cars, and that a call for her to rely on a transit pass is an implied call for her to live without a luxury they’ll retain for themselves. Jane can contemplate the deal she is getting — not the deal described in a perhaps compromised local press, but the deal she sees and experiences with her own eyes. 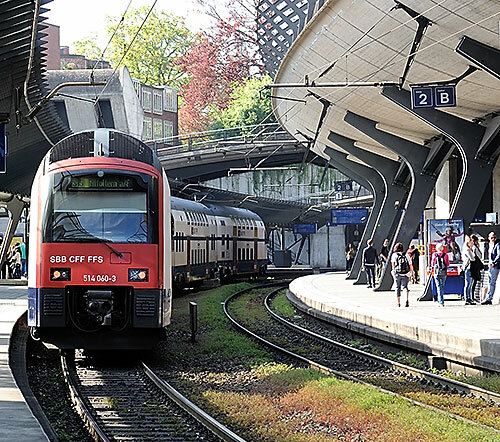 If she’s in Zurich, Copenhagen, Berlin, Vienna, Munich, Stockholm or Amsterdam, she’s getting an extraordinarily good deal, and may actually be joined on those S-Bahn trains by city leaders on their everyday commutes. The transit dream works in these places. I know it does; I’ve seen it. In other cities, Jane gets a good-enough deal; in still others, a so-so deal. In many habitually dysfunctional cities, the deal is rotten, and sincere, committed individual leaders in that city may be powerless to make it any better. If a disease like ebola ever goes airborne, commuters will cling to their cars like starving refugees clinging to loaves of bread, and will despise the earth trod by anyone who ever tried to talk them out of their car keys. Perhaps Mother Earth needs writers who will carry Her divine water. This entry was posted in Europe, Los Angeles MTA mass public transit environmentalism Red Line Purple Line Blue Line Green Line, Travel, Uncategorized. Bookmark the permalink. Post a comment or leave a trackback: Trackback URL.